Polished Gentleman has released their new Gentleman’s Growth Shampoo, specifically targeting men’s hair loss. Hair loss is a problem many men face as they age. For some, it happens early, for others it occurs later in life. Sometimes it’s hereditary, but for many it is instead brought on by stress, long-term exposure to chemicals, or lack of nutrition and proper hair care. But is there anything that can be done to undo or prevent these hair loss factors? According to Polished Gentleman, there is. 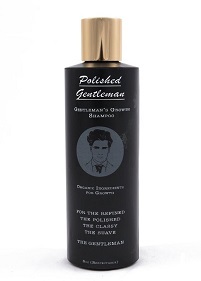 Sick of the products that claimed to help prevent hair loss, while still using chemicals and irritants that actually promote it, Polished Gentleman created this new Gentleman’s Growth Shampoo. They kick chemicals to the curb, keep the irritants out, and even avoid fillers, like water, that might weaken the formula. Instead, a combination of powerful natural ingredients is used. To promote hair growth rosemary, tea tree, eucalyptus, and peppermint are used. And to support that hair growth, as well as gently clarify, moisturize, and nourish, raw organic manuka honey, aloe vera, argan oil, cehami, oat amino protein, tapioca starch, vitamin B5, biotin, and more are added. Between all these potent ingredients, hair growth is stimulated and thicker, fuller, healthier head of hair is created. Then, add to all this, the fact that the shampoo formula is carefully pH balanced to match the native pH level of the hair and skin at 5.5. This helps to maintain the skin’s natural protector, the acid mantle. The acid mantle is what keeps dangerous microbes out and naturally produced moisture in. When the acid mantle is disrupted or stripped away by products that are too alkaline, the skin or scalp is dried out, irritated, even mildly burned, and exposed to potential infection. That’s why Polished Gentleman makes sure all their products are pH balanced at 5.5. After a lot of care and hard work, Polished Gentleman is finally ready to release their new Gentleman’s Growth Shampoo—specially formulated to stop hair loss, encourage hair growth, and give men the full, thick, healthy hair they deserve.